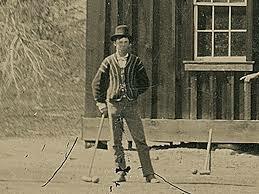 Imagine you found an old photograph in a junk bin in an antique store, paid sixty-eight cents for it, and then upon closer inspection realized it was a never before known image of Billy the Kid, his gang, and their women, playing croquet...imagine you had pretty much found the Holy Grail of Old West tintypes! Then imagine you had to go about the daunting task of making the world not only aware of your discovery, but making them believe in its authenticity. For the last six years the hypothetical scenario just outlined has been the daily reality of Randy Guijarro, a man who by now many in the western memorabilia world know well as the owner of the Billy the Kid Croquet tintype and viewers of the documentary "Billy the Kid: The New Evidence", which airs frequently on the National Geographic Channel, know as perhaps the luckiest antique "picker" alive. You see Randy and his wife Linda are the owners of what many believe is only the second authenticated image of Billy the Kid, and the only known image of Billy the Kid with his gang (known as the Regulators and immortalized for my generation by the cast of the Young Guns film franchise). The photo also features their wives and close female associates. Oh yeah, and to add to the distinctiveness of the photograph the group are all dressed in their Sunday best, without a gun in sight and engaged in a croquet match...not exactly a tableau many would associate with the rugged band of outlaws. This past Friday and Saturday, May 6-7th, Witherell's Old West Show rolled into the picturesque farming community of Grass Valley in Northern California and Randy's tintype was displayed for the first time publicly since he dug it out of dusty box in the now closed Fulton's Follies antique store in Old Town Clovis, California back in 2010. "I believe in divine providence and the only reason I went into that store that day was because a parking spot opened up right in front," said Guijarro. He walked inside the store to find a couple of gentlemen who had just brought in the contents from a storage unit they had bought in an auction (think of the A&E reality show Storage Wars). At the bottom of a cardboard box were some cabinet cards and a 4x5 inch tintype. Randy had two dollars in cash on him and offered to buy the three photographs in the bottom of the box. The offer was accepted and he walked out of the store, at that time unaware, that he had a photograph, that once authenticated, would be insured by Kagin's Auction House for $6,000,000. But back in 2012 Randy was still a man with just a dirty image of a group of people from the 19th century standing around playing croquet. 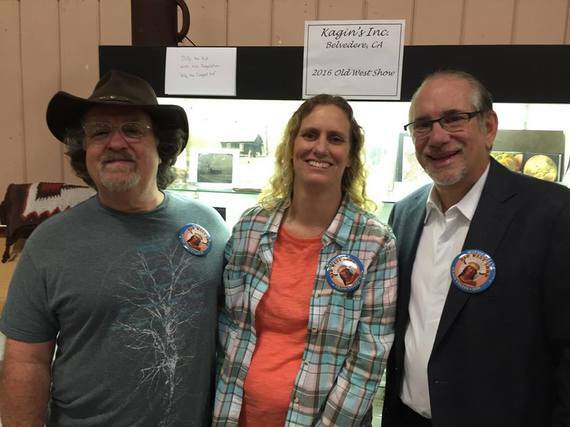 And so it was at the very same show that took place this weekend, the Witherell's Old West Show in Grass Valley, that Randy and his wife Linda first tried to have their antique store find authenticated. 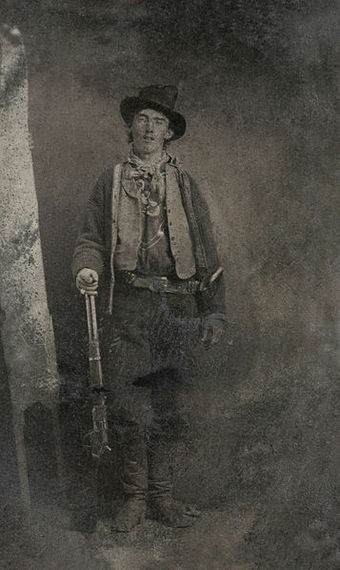 With the photo in his breast pocket Randy sought out Brian Lebel, the man who in June of 2011 brokered the sale of the only authenticated photo of Billy the Kid to date, the famous Upham tintype, to billionaire businessman Bill Koch of the Koch Brothers for a record-setting $2.3 million dollars. At that time it was the most expensive photo ever sold at auction. Randy showed Lebel his junk store find and it seemed that Lebel was initially interested but that was only until author and Western aficionado John Boessenecker walked by and basically shot down the photo's authenticity by saying there was no provenance. Provenance is a record of ownership of a work of art or an antique, used as a guide to authenticity or quality. Lebel said to bring him proof of provenance and then they would talk. 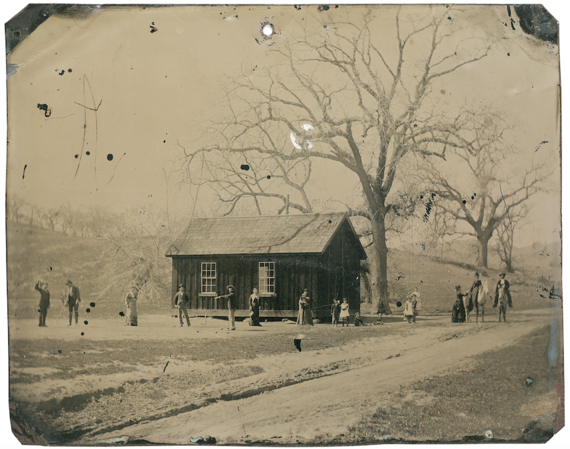 Thus began what has now become a four-year journey to authenticate the tintype. And it is a journey that has spawned one television documentary along with countless articles, online debates and one book in progress. Along the way, Randy and Linda have assembled a team of experts ranging from the official historian for the U.S. Marshals Service, David Turk, to Steve Sederwall, a retired US Marshall who is now a private investigator and mayor of the town where Billy the Kid once roamed, to Will Dunniway, the leading historian of nineteenth-century photography in the country, who all support the claim that the tintype is indeed authentic. This past weekend Randy and Linda arrived at the Witherell's Old West Show to a very different reception than they received four years ago. This time they were there to stand next to the Kagin's booth where the Billy the Kid Croquet tintype was prominently displayed. Where once upon a time Randy and Linda had been laughed at as wishful thinkers with delusions of grandeur this time they were greeted by many supporters, not the least of which were school teachers who want Randy and Linda to share their love of history and refusal to give up with their students. 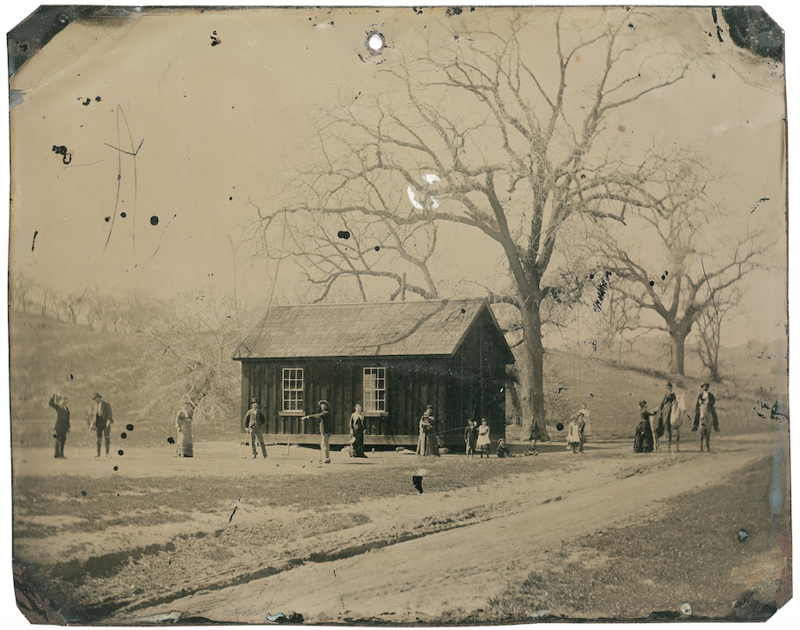 As for the authenticity of the photo, Jeff Aiello, the executive producer of the documentary about the quest to authenticate the tintype that aired on the National Geographic Channel said, "If you look at the statistical probability of all of the known people in the photo, who have been put through the facial recognition software test, being in the same place, which still exists and we can authenticate, at the same time, under circumstances that are well documented in a several extant documents, it is just mathematically inconceivable that this photo isn't the real deal." Only time will tell if the photo will sell and for how much. But in the meantime, its appearance on the scene has sparked an explosive discussion on the social history of the Old West and ignited hope for many amateur collectors who may have other valuable historical artifacts that have previously been disregarded by the academy of Western aficionados. Perhaps Randy's find will inspire others passing by piles of old photos in antique stores and on tables at swap meets to take a second look at the anonymous faces from days gone by.